The Alcatel 1X 2019 is a 5.5-inch smartphone that blends a bunch of entry-level and middle-class pros and cons. Being a low-budget model, its biggest drawbacks include a basic MediaTek MT6739ww quad-core processor running at 1.5GHz coupled with an equally-unassuming 2GB RAM . As of this specs-based review, a lot of competing models within its price group run on octa-core engines -- check out some of the best eight-core phones here. 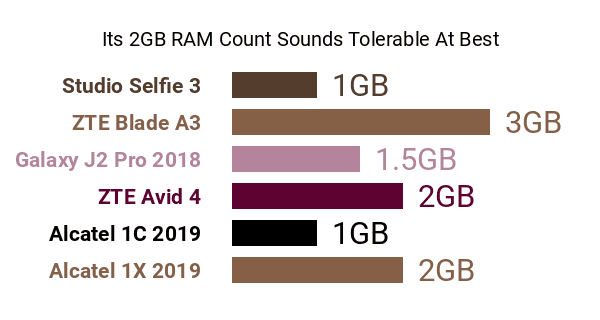 It also does not go beyond a mid-end 16GB internal storage memory , but it does support up to 128GB's worth of top-up storage , which is a big difference-maker against rival models that offer only 32GB or 64GB external memory ceilings. Another one of this 1X edition's cons is its modest 720p-only (1440 x 720) 5.5-inch display , although it's not a total setback, seeing that it comes with a wide 18:9 aspect ratio and that it dons a protective 2.5D Dragontrail cover glass , calling up this Phonerated list of the best phablets around. Its biggest pros, though, come from the imaging department. 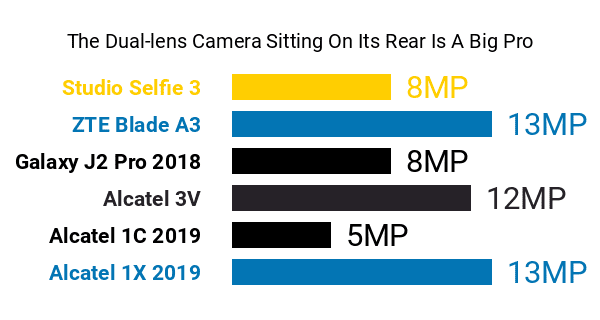 It touts a dual rear camera consisting of a 13-megapixel main cam interpolated (enhanced using software) to 16 megapixels and a 2-megapixel deputy cam for depth-of-field analysis. This dual-lens setup, which resembles the cameras rocked by some high-class photography smartphones, enables things like hardware level bokeh effects for portrait shots as well as post-shot refocusing. Up front, although it does not promise much when it comes to selfies, the fact that its 5-megapixel selfie cam is software-enhanced to mimic an actual 8 megapixel shooter sounds just about satisfactory to us. Powering the aforementioned pros and cons is a respectable 3000mAh battery that scores a 450-hour 3G standby time (420 hours on 4G), while the combination of Alcatel's Face Key feature and a fingerprint scanner leads its security suite. It is coated in what the brand pitches as scratch-resistant pebble paint, with the Android 8.1 Oreo rounding things out. 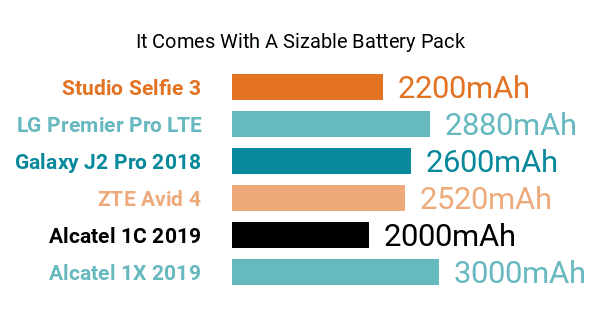 In essence, the 1X 2019 is a smartphone for users who are fond of mobile photography, but do not want to blow their budget.